cover art Alexander von Ness. A child's mind. How do you describe this miraculous engine for learning and behavior without providing an in-depth biochemical analysis of neurotransmitters, functional neuro-physiology, and electro-chemical dendritic synapse? Well, let's not go there… at least not yet. Imagine that young mind as the brand new laptop that you just purchased and pulled from its protective packaging. Its random access memory (RAM) clear and unbiased, willing to accept any and all new software and additional programming that we are prepared to provide. Such is the child's brain; a sponge willing to accept any information and stimulus provided; active or passive, friendly or unfriendly, good or bad. Back to that laptop. There is basic embedded memory, hard-wired into the system, but we now need to add those programs most important to us, based on our needs and interests. There are a couple ways in which we can implant these codes from an external source; by downloading the software from an on-line site—requiring us to sync our virgin processor with another server somewhere unknown—or by inserting a disc or thumb-drive pre-loaded with programs. A few users with certain knowledge and abilities will actually create a few of their own codes and to expand the utility of the system, reconfiguring its software, firmware and even hardware. This laptop readily accepts whatever we wish to install, as long as it doesn't conflict with something that already might be there. Just like the child's mind, these programs can be deleted, upgraded, or completely reprogrammed. Unfortunately, as we grow older, deletion becomes natural with a growing frequency, and reprogramming becomes extremely difficult. However, contrary to popular beliefs, you can teach an old dog new tricks! Just as we've seen the rapid development of the internet, computer processing and programming over the past three decades, so have our neuroscientists made tremendous breakthroughs in the field of mapping and reprogramming the brain. The field of Neuroplasticity evolved from what was perceived as quackery—programs to exercise the brain in elderly people by playing repetitive child-like games—to a science that is now supported by peer-reviewed functional MRI studies from renowned universities all over the world. As found in the 'Author's Notes' at the end of this story, this author has had first-hand experience in starting a company which developed the induction of neuroplasticity to restore vision in patient's blinded by stroke or traumatic brain injury. This Florida-based company used a head-mounted display to provide a visual therapy comprising of a repetitive photic stimulus which traveled through the blind eye, along the optic nerve, to the part of the brain that processes normal sight, the visual cortex. These processes, programs, and pathways are well-defined and understood. The result was the re-training of an adjacent part of the brain to take up the process of sight rather than using the previously damaged brain cells that were normally responsible for vision. These patients were initially determined to be legally blind. Following this treatment, the average patient's vision was restored by 70-80% allowing the majority of them to return to work, have their driver's license reinstated, and live a normal life without the need of a full-time care-giver. This therapy validated the possibilities of stimulating specific areas of the damaged brain in order to alter or repair its normal function. Since the eyes are an extension of the brain, they are the perfect conduit for reaching various segments of our brain that are responsible for a variety of functions. Researchers at Stanford University have also identified a phosphorescence protein that can be delivered to the brain and then stimulated by an implantable fiber optic to regulate various functions of the brain. These phosphorescent proteins could be turned on and off like the glowing tail of a firefly. By altering the light frequencies, scientists were able to control specific brain activities to treat a variety of disorders such as Parkinson's Disease, Epilepsy and Essential Tremors. If we continue to compare the programming of our brains to that of a computer, it merely takes such an energy form to manipulate the existing electro-chemical reactions that drive all of our memories and emotions. Such energy can be produced and delivered using light (optical or photic energy), magnets (transcranial magnetic stimulation), or soundwaves (high-intensity, high-frequency ultrasound). Other research centers have since been experimenting with opening up various other pathways in the brain to install new programs for a variety of applications, including lost memories in Alzheimer's patients. Due to specific country regulatory requirements, these "commercial" applications will not be readily available for years, or perhaps decades, to come. As with the first novel in this EQUITY Series, Equity of Evil, this story will describe the use of state-of-the-art medical technology that is manipulated for alternative purposes by evil people for the sake of controlling enormous global markets. Although the characters and stories here are fictitious, the capabilities of the technology described are feasible and well under development. Elizabeth Sanborn became violently ill at the mere thought of flying. Anything involving passenger airplanes immediately spawned nausea, panic and a dangerously elevated pulse rate, even if it didn't include her in any way. A photo might do it. Movies or TV news clips? She was forced to close her eyes, or look away, or even bolt from the room or theatre whenever they involved planes. Airports were nearly as bad. The malady was called aerophobia, and it spilled over into heights—acrophobia—those unnerving scenes where viewers were taken to the edge of tall buildings, looking down. She couldn't hike in any kind of hill country; could never approach abrupt drop-offs. Where others might simply gasp or feel stomach flips, Elizabeth's panic attacks were devastating. Terms used by others for her illness made little difference. As her earlier Neuropsychiatrist had patiently explained many times, a new therapy was available—neuroplasticity—the re-training of specific areas of the brain. He'd tapped areas on a colorful flip-chart as he delivered his recitation, using a long pointer. The hippocampus—right there, Mrs. Sanborn… tap, tap… is the area of the brain responsible for several functional memory tasks including the construction and storage of phobias. It also retains and processes short- and long-term memories both related and unrelated to these fears. In other words, we know where your fear of flying resides in your brain, and we have the ability to wipe out that fear, and even make you forget that you ever had it. He'd wasted his breath. She didn't care how the damn thing worked, and she was tired of dealing with shrinks. The latest so-called "expert" had finally sent her here, to the Neuroscience Institute in Boca Raton, where she'd actually be paid to be part of a study. What was there to lose? She'd go along with it, and besides, who wouldn't want to undergo a simple procedure to eliminate fear of any kind? It might even work! Consequently, she'd already spent several therapy sessions sitting in a comfortable recliner while wearing a contraption on her head. Its visor covered half of her face. This session would be no different, but it was to be her sixth and final visit. What would it bring? Would they do something different? She dug in her long fingernails into the leather recliner in anticipation of its beginning, bracing herself. As in previous sessions, hundreds of pin-head sized rotating specks of light came from a distant point in her visor, flying towards her, spinning, pulsating, growing ever larger, and then seemingly disintegrating before slamming into the front of her eyes. It reminded her of those scenes in Star Wars, when billions of stars would suddenly streak by when the Millennium Falcon went into hyperdrive. Their numbers increased, with movement so rapid she could no longer sense any changes in their frequency or color or rotation. Some flickered, others did not. She couldn't know that specific brain cells would eventually register the changes, even if she consciously noticed nothing different. The stimuli were then overlain by brief images designed specifically for her—a personalized visual pattern—designed to help overcome her greatest phobia, the fear of flying. Short, segmented video clips flashed before her: a picture of her sitting in a lush first class cabin, receiving a fluted glass of bubbling champagne from a handsome, male flight attendant; images of soft white voluptuous clouds outside her window; her arrival at the airport gate, where smiling family members embraced her with joyous affection. The flickering video clips reminded her of the segmented images seen when she'd fast-forward through a recorded movie on her television; each clear and distinct, traceable but not present long enough to consciously observe the details. If the flying circular "orbs" were still there, she wasn't registering them at all. Her brain was "processing" those visual patterns in her virtual-reality goggles as if she was actually sitting comfortably in her first-class seat on a jumbo jet while a movie began and a gourmet meal was served. Her husband was miraculously sitting next to her and tenderly holding her hand. Gradually her grip on the recliner relaxed. Just an hour earlier, the handsomely-tanned technician had inserted a small needle in her vein, attached to an intravenous bag containing the "magic syrup" on a pole beside her chair. Watching it slowly drip into the tubing leading to the back of her hand, she braced for that now-familiar "head rush" with its feeling of floating, accompanied by a slight touch of nausea. Magic syrup was their casual term for the "accelerant." She'd managed to remember that by thinking of her car's accelerator, but everything after that was scientific gobbledygook. Miniscule amounts of the neurotransmitter invading her blood stream were tightly bound with an appropriate concentration of mannitol, a substance that helped carry the accelerant across the blood-brain barrier to the appropriate region of the hippocampus deep in her brain. After reaching its targeted area, it would act as a catalyst to open up specific pathways, like opening the valves in a convoluted series of pipes so as to redirect the flow of water to specific areas. They'd told her that much several times, but again she didn't understand any of it. Apparently it was something they told everyone, maybe some FDA regulation they had to follow. The technician had then adjusted her head-mounted display. "Let me know when you can read the four letters in each corner of the grid," he said. "They should come into focus as I adjust for the distance between your pupils." She'd heard that, too, half a dozen times before. The device was similar to those virtual reality goggle she'd seen advertised in magazines for viewing movies or for those spoiled kids who needed to have the latest gaming equipment. "There—I can see them now." "Excellent, Mrs. Sanborn. Just like the last procedure, you should soon see those orbital stimuli coming right at you, followed by your visual program." Seconds became minutes as she was drawn into a dream-like state while her brain underwent a remapping, restructuring, reorganization. The therapy was compared to brain rehabilitation. Once the pathways were open, the flying photic orbs served to exercise, or rework, specific sets of neurons in her brain. These were equivalent to miniature compartments that held complex electro-chemical sequences—each pattern representing a memory. A region containing these targeted brain cells could be likened to the programmable memory of a computer… better known as random access memory, or RAM, a re-writable temporary memory storage that allowed multitasking. With proper access, a well-written code and the right reprogramming, the patient's memory could be replaced or manipulated. In Elizabeth's case, a specific sub-compartment of her brain was responsible for her fear of flying. It was now being re-trained to make such an action a comfortable and pleasurable task. Somewhere in the far distance she heard a familiar voice, whispering. "Okay Mrs. Sanborn, we're bringing you back home now." She'd welcomed those words during her first session, one lasting well over two hours, but she was actually disappointed that it was all coming to an end. Now she was looking forward to her complimentary flight back home, the last step in her treatment. That realization was not only shocking in itself, but amazing. A flight back home was something to look forward to? The train ride down from Washington, D.C. had taken nearly a full day. It would now be replaced by a ninety-minute maiden voyage intended to complete and verify the functional outcome of her therapy program. As with the displayed images, her family would be waiting for her at the arrival gate. As she removed the display visor, taking care not to pull any of her hair along with it, she recognized one of the other patients undergoing therapy across the room. His chair was directly opposite hers, one in a row of recliners spaced apart just enough for a technician to stand while monitoring IV infusions. The same technician might manipulate small touch screens controlling the mini-processors that generated images on her display screen. The room was comparable to the patient area at the Red Cross, where she'd often donated blood. "Isn't that one of the Alzheimer patients I read about in your brochure?" she asked. The woman technician removing her IV needle nodded. "Yes, he's one of two thousand patients in a controlled study aimed at obtaining FDA approval for the treatment of memory loss due to Alzheimer's disease. I hear it's working extremely well. One elderly woman claims to have nearly one hundred percent of her memory back." "Oh my, that's just wonderful!" "I know, but personally I'm still not yet convinced. I think the visual programs are designed in such a way that they are actually creating new memories rather than restoring lost ones. But then, just consider your own situation. You're taking your first flight in less than two hours and here you are, more interested in other patients." "Yeah, you're right! I'm not even a bit concerned… well maybe a little. They won't lose my luggage, will they? I heard that happens quit often." Laughing, the technician took her by the elbow. "Mrs. Sanborn, you're going to be just fine." Beneath his visor, the Alzheimer patient transitioned from pulsating tiny orbs to images of his loved ones, his home, old video clips masterfully edited together in his personal montage, all in a repeating digital loop that increased with tremendous speed. He stared straight ahead as if lost in a trance. A smile began to part his pursed lips and his grip on the recliner arms eased. Similar to the classic amnesia patient, his Alzheimer's disease had damaged critical areas of the hippocampus in his brain. Gone was his long-term memory and, as time passed, even more recent memories seemed to escape him. A similar cocktail of the magic syrup now coursed through his blood, only at a slightly higher concentration. The attached carriers were finding their targeted areas deep in the brain, helping transport the associated chemical compounds through vessel walls into surrounding tissues, like the rain seeping through a screen door. Binding with neurons within the hippocampus, the drug was opening a variety of pathways not yet well-understood by neurobiologists. Images of family members sitting around a Thanksgiving dinner created action potentials in these drug-saturated neurons now bursting with renewed synaptic energy. An old memory was replenished and the renewed region provided it a home in which to reside. The hippocampus in the medial temporal lobe of his brain was part of his overall limbic system, and such rejuvenated memories would soon affect other key areas in his cerebral cortex, stimulating related emotions and reactions. An hour into the session, his "memory" of that particular Thanksgiving dinner would cause an emotional tear to form in his eye, but prior to that he'd had no recollection of Thanksgiving dinner being any different from any other dinner he'd eaten that week. Rudy A. Mazzocchi is best known as a medical device and biotechnology entrepreneur, inventor, and angel investor, with a history of starting new technology ventures throughout the U.S. and Europe. He's been privileged to have the opportunity to see the newest innovations in healthcare and work with some of the most brilliant researchers, scientists and physicians in the industry. Authoring more than 50 patents, he has helped pioneer new companies involved in cardiology, oncology, orthopedics, neurosurgery and even embryonic stem-cell development. Through these efforts, he has become the recipient of many technology and business awards, including the Ernst & Young Entrepreneur of the Year in Healthcare and the Businessman of the Year Award. Combining these experiences and opportunities, with thousands of hours of travel and long evenings in hotel rooms, he found the initiative to start writing a collection of medical thrillers based on true events, the first of which is entitled Equity of Evil. Equity of Evil book 1. 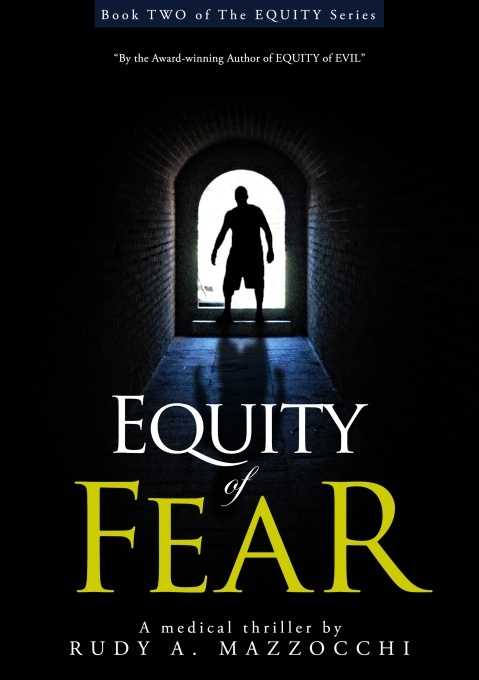 Equity of Fear book 2. Equity of Life book 3. Equity of Fear Copyright © 2013. Rudy A. Mazzocchi. All rights reserved by the author. Please do not copy without permission. Rudy Mazzocchi received the Global Business Recognition Award as the 2013 Entrepreneur of the Year. Equity of Evil by Rudy Mazzocchi is the winner of the Gold Medal for the Mystery/Suspense/Thriller category in the 2011 eLIT Awards and is a finalist in the Suspense/Thriller category of the 2012 Next Generation Indie Book Awards and the winner in the Suspense Fiction category of the 2012 Global eBook Awards. "Another amazing one. Very hard-hitting and visceral. Great science. Good to read a medical thriller that's not dumbed down. Really enjoyed the theme of how different characters deal with their pain." Book cover design by Alexander von Ness. All rights reserved. This page last updated 03-25-13.